If you’ve watched the trailer for Boo, you may have been impressed enough to consider buying or renting the movie. If you do so you may get a shock, but not in the way you expected because the trailer makes the Boo movie appear to a lot better than it is. The setting is good and the special effects are not bad, but other than that, the movie doesn’t have a lot going for it. Boo was filmed at the Linda Vista Hospital in Los Angeles and it’s a very spooky-looking place that just oozes atmosphere. The hospital first opened its doors in 1904 and remained operational until 1991. Since its closure, the Linda Vista has become an epicentre for paranormal investigations. It’s also a popular filming location and a number of horror movies, including Deadgirl (2008) and The Lords of Salem (2012) have scenes that were filmed there. Unfortunately, a good horror movie needs to have more than a good filming location. One of the big problems with Boo is the characters are not very believable. When they act scared, it’s easy to see they only acting scared. When it’s so easy to see people are only putting on a show of emotion it destroys character credibility and makes it hard for viewers to get drawn into a story. So if something bad happens to one or more of the characters, people are unlikely to care. Two college couples—Freddy and Marie (Josh Holt and Nicole Rayburn) and their friends Kevin and Jessie (Jilon Ghai and Trish Coren), decide to spend Halloween together at the deserted Vista Mira Hospital. What the girls don’t realize is that the guys have sent their friend Emmett ahead of them to prepare a few Halloween surprises. Of course, when the gang arrives at Vista Mira there is no sign of Emmett or his dog and some of the Halloween surprises seem just a little too real. It’s around this time that viewers discover—rather conveniently—Jessie is psychic. Someone else is roaming the creepy corridors of the hospital. His name is Allan (Michael Samluk) and he’s looking for his sister, who disappeared when she visited the hospital with some friends. Meanwhile, Alan’s sister, Meg (Rachel Melvin) is doing a little corridor roaming of her own. There’s a police presence in the Vista Mira as well. Officer Arlo Baines (Dig Wayne) looks a little like a pimp from a bad 70’s film, but his heart is in the right place. He’s only there because he used to work with Allan and Meg’s dead father and feels duty bound to look out for them. The only other characters in attendance are the ghosts. Everyone eventually ends up on the third floor that used to house the mental patients and, once there, discover they are trapped. The DVD has some bonus material, including a short documentary called Intensive Scare: Tales of the Linda Vista Hospital. It contains interviews with the cast and crew and they share stories about their own strange on-set experiences during the making of Boo. 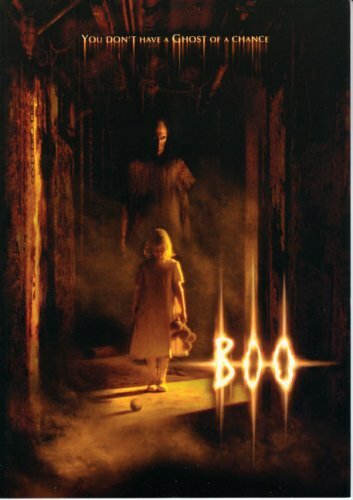 If you are looking for a good horror movie about a haunted building, there are many better options than Boo. The Legend of Hell House (1973) is a good example. The special effects aren’t as clever as the ones used in Boo, but it beats the hospital horror in every other way. If you are searching for a good Halloween movie, though, you’d be better off thinking “Michael Myers” and renting or buying a copy of John Carpenter’s Halloween.